In the early 1970s, a group of hotel and restaurant managers from across the state identified a strong need for educated graduates in the field. They brought the idea of a program to the university, and after approaching several academic units on campus, the College of Agriculture, Food and Natural Resources agreed to house it. The relationship that formed has become a sort of symbiosis between the college, the program, the students and the industry. Hospitality management graduate Shannon Higgins (B.S. ’14) exemplifies this connection. Higgins was in the food and beverage emphasis area of the program and is now employed as the events and services manager with the National Association of Farm Broadcasting (NAFB). While in school, she also took coursework in agricultural leadership and exposed herself to those with majors different than her own. She said that growing up in a rural area combined with studying in CAFNR set her up well. 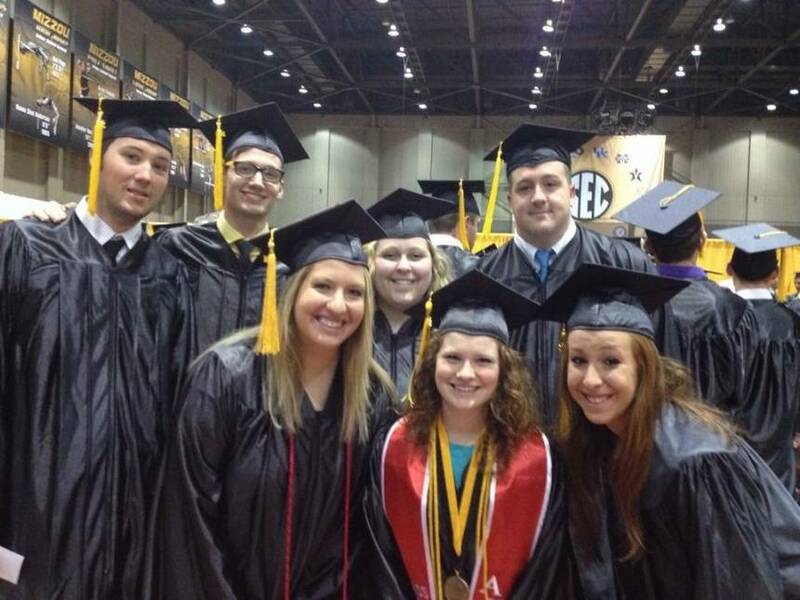 Higgins , front center, is joined by her food and beverage management classmates on graduation day in May of 2014. “A lot of people are surprised that hospitality management is in CAFNR, but I think there’s a close tie there,” Higgins said. That tie is knowing the full circle of food, from field to table – something that is valuable in every area of hospitality, she said. Born in raised in Augusta, Missouri, Higgins’ hometown of 255 people has one winery for every 23 of its citizens – 11 in total. While in high school and into college, Higgins worked at some of these venues washing dishes, working in the kitchen and as a server. Coming into MU, Higgins did not yet know what she wanted to pursue. Engineering, the medical field, and hospitality were all on the table. 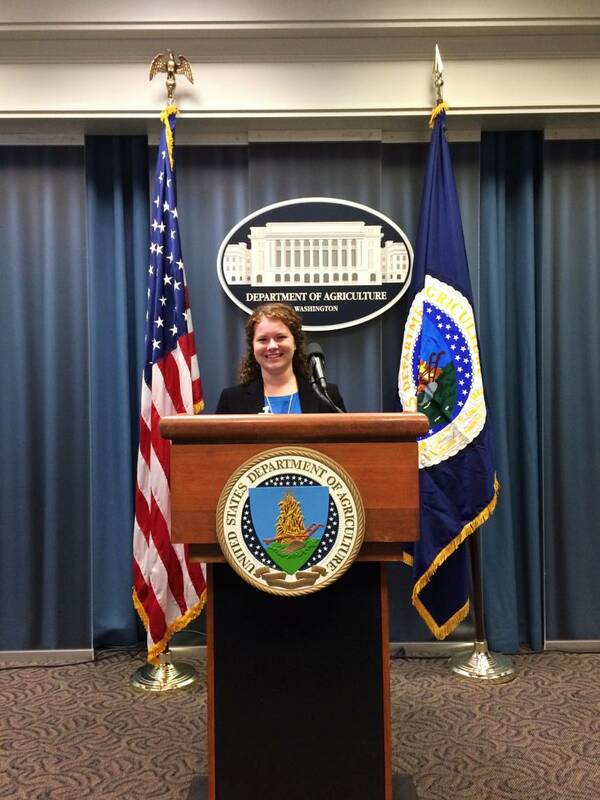 After spending a year and a half undeclared, she landed on food and beverage management. The fit made sense given her enjoyment with her previous experiences, she said. During her time at MU, Higgins worked for the Culinary Café at Eckles Hall. During the day, students work the café’s lunch hours and in the evening those in the capstone class put on a dinner series complete with menu planning, recipe tasting and service training. Higgins quickly realized that while she was not quite a natural with the cooking side of things, she had a knack for hosting the event, serving as the front-of-house manager. At the café, she was responsible for training her staff in product knowledge and customer interaction. She also discovered a pleasure in making organization out of the chaos that comes with any event. Higgins at a recent event at the United States Department of Agriculture with NAFB. While not in class or directing a dinner, Higgins found plenty to keep her occupied. She was an active member of Alpha Chi Omega sorority and spent a summer interning at a winery in France. She was the recipient of the Emma Jean Ballew Agricultural Scholarship and the Wurdack Scholarship and was named to the dean’s list for eight consecutive semesters. Before her current position, Higgins worked as the assistant director for the Savannah Food and Wine Festival in Savannah, Georgia. The festival, which helps to increase tourism during a normal down time, hosts over 25 events, some with an attendance of over 7,500 people. According to Higgins, the festival was a “saving grace” for many hotels and restaurants following the devastation of Hurricane Matthew. In her current role, Higgins takes the lead on planning the annual NAFB convention and plays a hand in their agribusiness luncheon as well. Their conference, which takes place every November in Kansas City, Missouri, hosts broadcast professionals and agricultural industry leaders to promote the interests of the agricultural community. Approximately 600-750 attend. Higgins has been working with local hotels and catering companies, and procuring sponsorships for the event. While event management is not where Higgins started out, she certainly has no regrets. “I don’t think I really realized that events was where my career was going until I got there and I was like ‘OK – this is my thing,’” Higgins said. She enjoys the behind-the-scenes aspect – keeping attendees unaware of the caterer that forgot the forks or the event room set to the wrong temperature – and then watching as guests smile and enjoy the fruits of her labor. Three years out of graduation, Higgins still remembers the atmosphere when she showed up at MU for the first time.